I have cobbled together this info from too many to mention web sites if you know more let me know. Also I can’t remember for the life in me where I was when I took the photo possible Nottingham as the bus behind is a Barton Transport fleet no 703. The location is undoubtedly Nottingham Huntingdon Street bus station – long since disused. 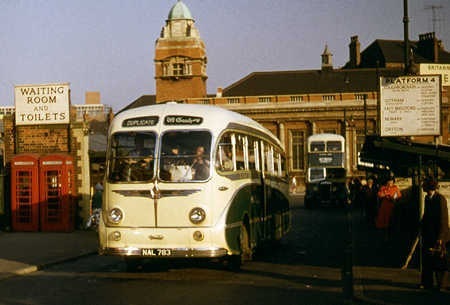 It may be of interest that Huntingdon Street bus station was host to no less than ten different operators in the 1950s – Trent (about 12 routes or groups of routes), Barton (4), East Midland (3 joint with Trent), Midland General (3), Mansfield District (2), South Notts (2), Lincolnshire (1 joint with Trent), Skills (1 joint with Trent), W Gash (2) and Nottingham City Transport (1) – a mish-mash of AECs, Leylands, Daimlers, Bristols and the occasional Guy, in various shades of blue, green, red, purple and brown. Yorkshire Traction to Leeds via Sheffield, Barnsley and Wakefield… later as part of what was combined by United Counties/Yorkshire Traction to form the first Leeds – London service changing at Huntingdon street. Huntingdon street bus station long before the national express routes we know today was a major hub/interchange link for all of the above operators there were a few others as I remember but at this moment in time cannot remember their details hoping this adds a little more info to your entry. Hi Mickey, you are quite right about the other operators. I only listed the regular local and interurban bus routes, as opposed to longer distance coach services, though some of the local operators (Trent and Barton in particular) also ran coach services, mainly to the east coast resorts. By the early 1950s (the earliest I can remember) Midland Red’s X99 Birmingham service had been transferred to Mount Street bus station, where it shared platform 6 with selected Trent routes. Actually Mount Street only had 3 platforms, numbered 4 (Midland General/Notts & Derby), 5 (Barton) and 6. Not sure why there was no 1,2 or 3! I think the idea of Mount Street was to hive off all the routes that left the city in a north westerly direction via Canning Circus, so that they didn’t have to fight their way through increasing traffic around Huntingdon Street. Well now, there’s another operator that I had forgotten at Huntingdon Street. North Western were equal partners with Trent on route X2 to Manchester, via Ilkeston, Ripley, Matlock, Buxton and Stockport. It was "limited stop" rather than a true express service, and also had a strict "no setting-down" restriction until after Ripley (to protect Midland General’s B2). This area was a hive of activity in those days, across from the bus station were the Central Markets, opposite was the Palais-de-Danse, there was also a short cut for bus passengers wishing to get to Victoria Railway Station. Strange how the focal point of a city can be altered over the years, I suppose construction of the two shopping centres led to that. I was often taken on shopping trips to Nottingham by my parents and we usually concluded the shopping down the Huntingdon Street end, I always enjoyed a visit to Notts but the one thing I hated was the long trek back to Mount Street to get our (Midland General) bus home! Today, Huntingdon Street is quite a dead area, apart from passing traffic, and so too, for that matter is Mount Street! Is the saloon next to the Gash decker a Barton’s own built MK2 Veiwmaster? Roger – in a word yes! And lovely vehicles they were to travel in too. Comfortable coach type seats, and orange Perspex panels in the roof which could make even a dismal wet November day seem sunny – until you alighted of course! I have spent many a happy half hour travelling from Long Eaton to Nottingham in one of these on routes 3/3C, 10 and 11 in the mid 1950s. Re Mickey Summers comment above: I can think of two more operators not mentioned as yet, West Yorkshire Road Car Co (whose coaches were in daily use on the Yorkshire Services pool), and Ribble Motor Services who contributed to the X2/X60 connection to Blackpool – more often than not a through vehicle in the summer months with everything from all-Leyland Royal Tiger coaches to BET Federation 36 ft service buses in drab all-over red appearing in Huntingdon Street. Does anybody know why Nottingham corporation route 25 terminated there, or to put it another way why just the 25? Fond memories. The iconic tram-shed is still in place and currently being advertised as luxury apartments. A great shame – it would have made a superb bus museum for the area and with the vehicles known to be in preservation a passable good recreation of Huntingdon Street in its heyday could have been held on a regular basis. If I ever win the jackpot on the Lottery those flats are being ripped back out again! In answer to Neville, the 25 was the last of three NCT routes that originally started/terminated at Huntingdon Street. It was a circular to Mapperly Westdale Lane – out via Carlton, in via Sherwood (25A in the opposite direction). In the 1930s it was virtually an out of town service, going to the limits of where housing development was just starting. The other two were to Hucknall via Basford and Bulwell (route 22 at the time) – later discontinued as Trent served that area; and route 19 to Lenton Abbey, near the University campus. Geoff Atkins’ photos show AEC Reliances in Huntingdon Street on routes 22 and 25, and a 1935 Regent/Northern Counties with its blind set to "19, Huntingdon St Bus Stn via Derby Road and Wollaton Street." 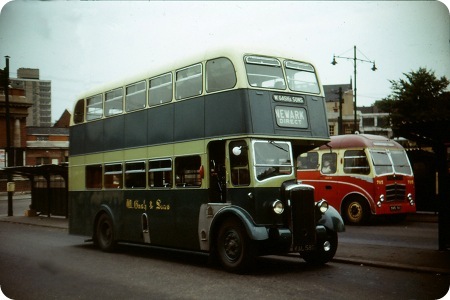 Re operators of Daimler buses with Massey bodywork – Peter Gould lists in SHMD Fleet List four Daimler buses owned by SHMD with Massey bodywork. They are HMA 12 (Daimler CWG6) and HMA 155,156 and 157 (all CWA6’s). Info of any interest? Just been reading through the site on Huntingdon Street bus station Nottingham. Stephen, just reading your comment above made me think you may be able to help me with some research I am undertaking re. the end of crew operation around the UK. I don’t have a final date for Trent; you mention you were still a conductor in 1983 which I imagine must be close to the date when Trent became 100% o-p-o. Any idea when the final date may have been, please? 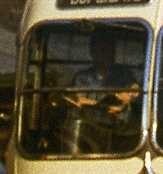 In reply to Dave Towers, I passed my bus test 10/10/1983 and I was one of the last conductors to go driving at the Nottingham depot there could well have been some after me at the Derby depot. So I would think by end of October 1983 it would have been 100% o.m.o, hope this helps, (might be able to find out exactly still know one or two at Nottingham) who might be able to help me. Regarding the comments on Strachans, I have been trying to ascertain their history without much success. I do have a photograph of the interior of their works in West Acton in 1935 with a line of Austin Taxi’s all bodied by Strachans. I live in France and have discovered a 1935 Austin taxi with a body by Strachans which I am renovating. I am missing the small brass plaque which says "Body by Strachans" and their address, if anybody has such an item I would be delighted to purchase it. Strachans at Hamble did indeed start in London. The ‘history’ is not ‘straightforward’, and may well get put into a book in due course ! (A not particularly accurate article did appear in an ‘Annual’ some years ago). The origins of the firm were with W E Brown, who began as a coachbuilder in Shepherds Bush in the 1890s. He went into partnership with S A Hughes – and – as Brown & Hughes – they bodied many of the earliest motor buses (including the initial Milnes Daimlers at Eastbourne) – in fact they later claimed to build the first double deck motor bus ever made. In 1907 B & H were joined by J M Strachan, and the firm was renamed Brown, Hughes & Strachan – a company registered in December 1908. J M Strachan was also proprietor of Aberdonia Cars – also with a factory in Shepherds Bush (he came from near Aberdeen), and BH & S bodied these. They moved to new premises at the (then new) industrial estate of Park Royal in 1912, and in early WW1 work included ambulances. However, Messrs Brown and Strachan were removed as directors in April 1915, and in June that year there was a disastrous fire. Meanwhile, Messrs Brown and Strachan set up a new firm – trading from July 1915 from premises in Kensington where BH & S had been previously — the firm being a partnership under the title Strachan and Brown (ie not a ‘registered company’). They built – amongst other things – aircraft during WW1, and from 1920 or so got back to ‘what they knew best’ – ie motor vehicle bodies. Several patents were granted for special springing, opening windows, opening roof etc. They often built bodies for chassis builders who had quoted for ‘complete vehicles’, (AEC and W&G for example) as well as supplying bodies ‘direct’. S&B moved to a new, purpose built factory (designed by J M Strachan) in 1923 at Wales Farm Road, Acton. However, there was a ‘disagreement’ between Brown and Strachan, such that in November 1928 the Commercial Motor announced the partnership had been dissolved. (There were related court hearings). At this point, W E Brown became a director and principal of Duples (where 2 of his sons also held senior positions). It is at this point that Duple’s coachbody sales ‘accelerated’. The firm at Acton then became just ‘Stachans’. However, J M Strachan died in June 1929 – and the firm never quite had the same flair having lost both of its founders. From October 1929, the company became Strachans (Acton) Ltd. A further name change came in August 1934, when the name Strachans Successors Ltd is adopted – and the firm continues under this title until well after WW2. A holding company – Giltspur – then acquired the business, and they subsequently moved production to Hamble, Hampshire, on part of the airfield there, ‘A’ and ‘G’ Hangars were leased to Strachans by April 1960 (possibly earlier). Later this became part of a specialist vehicle building group called Glover Webb (who made armoured land rover type vehicles), but the airfield was sold in 1984 for housing, by which time Strachans as such had ceased to exist. Further to Peter Delaneys helpful info, a web search reveals that a meeting took place on March 30th 1976 at which it was agreed to wind up Strachans Coachbuilders Limited and Strachans Engineering Limited. This ties up with the reported move of Glover Webb to Hamble around that time. Any suggestions for the last Strachans bus body to be built? Thx Peter, for this concise history of a company with a complicated past! I’ve read titbits over the years and they’ve conflicted, unsurprisingly. Despite finishing up in Hamble, Strachans were not really supported by its neighbouring bus operators. Only Provincial gave them an order for nine single-deck Seddon/Strachans in 1968, which might well have been a unique combination. Thanks for that, Peter. Looks like another case of a great might have been (such as I have mentioned before – Metalcraft, Sentinel and Foden). In that period of "get what you can, when you can" in the immediate post war period, Sheffield’s only PS2 Tigers (most were PS1) had Strachans bodies. A long way to go for emergency provisions! I think Chris you have overlooked the 6 AEC Swifts Numbers 1-6 taken by Southampton Corporation in 1967/68. Ah, Yes, Pat, I stand corrected on them! Regarding Strachans bodies, I understand that some of those built in the 60s included faults that limited their life. Those purchased by Wolverhampton on Guy Arab V chassis in 1967, were scrapped after only 7 years and most of the chassis were sold to Hong Kong. With reference to Lincolnshire Road Car running from Huntingdon Street to the Lincs east coast. This was Express service A and started from the Skills booking office on Alfreton Road (Peveril Terrace) and proceeded to Huntingdon Street. It then ran via Newark and Lincoln (same route as Trent) but branched off in Wragby to Mablethorpe via Louth. From Mablethorpe it travelled down the A52, through Sutton on Sea, and diverting off the main road calling at Anderby Creek and Chapel St. Leonards before continuing to Ingoldmells. The service terminated at Butlins. I have fond memories of making this journey with my parents regularly to Chapel St. Leonards, as we had a caravan there from 1949 onwards. Bristol L types were the mode of transport of my childhood, painted in the "coach" style of predominantly cream with Tilling green lining – a reverse of the stage carriage livery on these vehicles. A bit more miscellaneous info for Peter Delaney. I am not sure of the date but following a fairly lengthy strike, we were all brought into the office at 1000 on a Friday morning and told that the company was closing and we had to be out by 1200. Probably late 72 or early 73. A very sad time as some of the old hands had even built their toolboxes into the walls. They brought a few people back on a six week contract to clean up and sort out the drawings etc. ready for the take over. There were only a few of the Ford Transit chassis/cowls remaining as Fords had removed most of their stock before the strike started. I quickly lost contact with the drawing office staff although I did hear that Neil Moore who was the Chief Draftsman with Strachans did stay on with the new owners. In the latter days we were looking at building dedicated school buses similar to the North American style as they also used the truss panel construction methods. We also spent time working on the drawings for how to ship buses out in CKD and SKD for overseas assembly but the end came first.